Watch the imagination of two boys skyrocket as they build and build in a different kind of theme park: Legoland, and other fun attractions in Carlsbad, California reviewed. Since 1932, youngsters have enjoyed building their own creations from tiny plastic bricks, thanks to Ole Kirk Christiansen, a carpenter from Billund, Denmark. In 1968, the first Legoland Amusement Park opened in Billund featuring kid-friendly amusements made from the famous Legos. For awhile this was the only Legoland, until in 1996, another opened in Windsor, England, near London. After years of deprivation, the U.S. finally got its own Legoland in 1999, located in Carlsbad, California. In October 2011, another Legoland opened in the U.S. in Winter Haven, Florida. 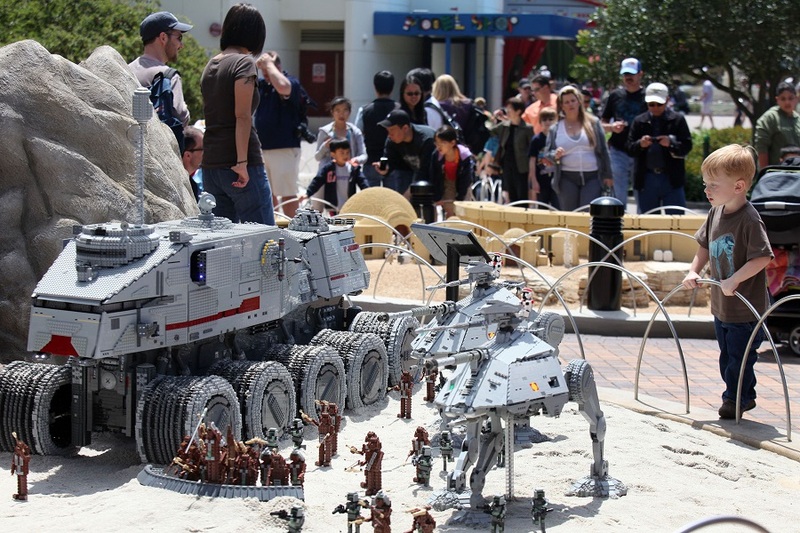 Legoland California has certainly lived up to its famous legacy. With over 1.9 million visitors every year, the park has pleased young children and parents alike for over a decade. Since my kids have been playing with legos for years, we knew we needed to visit this intriguing amusement park. When we told people where we were going, some looked skeptical. After all, the idea of most theme parks these days is thrills and chills, high-speed rides, laser light shows and a roster of cartoon characters that already parade across our TVs, T-shirts and lunchboxes. They wanted to know, “What is there at Legoland? Piles of Legos lying around?” Well there actually are lots of Legos lying around in certain areas of the park waiting to be transformed by the creativity of visiting kids, but Legoland is a lot more than that. And while the trend in parks is to keep adding bigger, faster, scarier and higher-tech rides to attract crowds, Legoland prides itself on its laid-back image. The Technic Coaster is the fastest ride, with top speeds of 35 mph . (Compared to coasters that go up to 100 mph at other U.S. parks, this may seem too tame for kids over age 7.) Another favorite coaster is the Dragon, with top speeds of 15 mph. This more scenic than terrifying trip through a castle and away from a fire-breathing dragon demonstrates why the rides here are billed merely as “pink-knuckle” in theme park parlance. There are lots of rides that even preschoolers can do themselves, including Junior Driving School where pint-sized dragsters aged three to five can steer electric Lego vehicles on a track and receive their first licenses. Older children really drive on a grid of streets complete with traffic lights and stop signs after learning the rules of road. The youngest visitors will love the Village Green where Duplo (the larger sized bricks for tiny fingers) reigns. There, even babies can play in interactive fountains perfect for hot summer days, or spend hours in Playtown, a 13,000-square-foot Duplo playscape where they can climb, swing and crawl through a maze, farm, garage and toddler-size train. There’s also Fairy Tale Brook where children can ride boats past their favorite characters — all made out of Legos, of course. The designers added a touch of whimsy here as they did throughout the park: look for Prince Charming on his white horse talking into his cell phone and Little Red Riding Hood with blow dryer in hand. Although you can do this park in one day, it’s worth coming back for a second to hit whatever you missed and to just look around at all the fantastic Lego creations. The family of ducks floating in a pond may look real, but they’re actually made of Legos as are the life-size water-spraying elephant, a construction worker exiting a manhole, and an alien waiting on line to make a phone call. The Lego dog relieving himself on a fire hydrant really does when the sprinklers are turned on! Complete with sound effects and moving parts, you’ll see an animated Lego Mardi Gras parade in New Orleans, cheering crowds greeting the president’s motorcade in Washington DC, windsurfers and bungee jumpers in Southern California, a working New England harbor, and window washers scaling a New York City skyscraper. My kids loved searching for amusing details, like the alligator in a Manhattan sewer and (their favorite) the commuter sitting on a toilet reading the newspaper in a cutaway of Grand Central Terminal. It was nice to see kids jaded by video games and action-packed cartoons proclaiming everything “awesome.” After years of building their own creations out of Legos, my kids were amazed at what the professionals could create with a handful of the same stuff they’ve got at home. By day’s end, they were hankering to build something of their own with the mountains of Legos provided in the Imagination Zone. My 9-year-old designed a ball-shooting robot programmed by new LEGO computer software and special chip-imbedded bricks, while his 4-year-old brother built a battery-powered windmill and racecar he got to race on a timed track. Refreshingly, for a theme park, there are no movie or TV tie-ins; no glitter, and no junk food. (We had to look hard to find ice cream.) Restaurant menus abound with made-from-scratch gourmet food including breads, salads and pastas. You can even buy bananas, apples and oranges instead of cotton candy. Yet, despite its pitch as a kinder, gentler theme park, you’ll be reminded that it’s really a gigantic advertising and marketing tool for the toy products when you hit the gift shop and expensive Lego sets abound. But at least you can rationalize it; compared with most souvenirs that get dusty sitting forgotten on kids’ shelves, a Lego set is a purchase that will offer hours of future activity. All I know is that besides having a blast, being surrounded by 50 million Legos set the imaginations of my own two Lego maniacs afire. The minute my sons walked in the door at home they delved into their own stash of the colorful plastic stuff and began building an intricate mini version of Legoland on our dining room table. Now that’s more than you can usually expect from a weekend at a theme park. The park unveiled a great new addition, the Legoland Waterpark. This adventure-filled water play-zone has everything necessary to cool down on a hot day. The five-story Lego tower lets kids plummet through tubes to an open pool and the six-person rafts give a thrill to the whole family. This section of the park requires a separate admission fee. Miniland also expanded with the amazing Star Wars Miniland featuring 2,000 Lego models of characters and scenes from Star Wars movies, including the latest, “Star Wars: The Clone Wars” from which a line of Lego models was built. Legoland California is near Carlsbad, California, about 30 minutes north of San Diego off Interstate-5. Note that park designers keep their young audience in mind everywhere, with lower cafeteria counters, kid-high drinking fountains and even family bathrooms. The Baby Care Center offers nursing mothers a place to take a break with rocking chairs, changing tables and complimentary diapers. If you want even more time with Legos, there is a 250-room, super-themed Lego Resort hotel right on the premises. If you want to stay nearby, there is a Sheraton and a Grand Pacific Palisades hotel, as well as many wallet-friendly hotel and resort choices in the Anaheim and Carlsbad area. There are many, many other attractions in this area of southern California. Disneyland is about 1 hour north in Anaheim; Sea World and the San Diego Zoo are approximately 30 minutes south. True Lego fans will be pleased to note that there are now seven Legoland Parks in the world – the original Legoland Billund in Denmark, Legoland Windsor outside of London, Legoland Florida in Winter Haven, Legoland Deutschland near Günzburg, Bavaria Germany, Legoland Malaysia, and Legoland Dubai.